Assessing Language and Learning with Pictures (ALL PICS) is an assessment tool designed to be used in conjunction Dr. Mark Sundberg’s Verbal Behavior Milestones Assessment and Placement Program (VB-MAPP). ALL PICS was designed by behavior analysts who specialize in the application of Skinner’s analysis of verbal behavior and have extensive experience in assessing verbal behavior with assessments such as the VB-MAPP. This week only, take 15%* off ($90 savings!) your order of the ALL PICS assessment program by using our special promo code ALLPICS at check-out! ALL PICS was designed to make administration of the VB-MAPP more accurate, efficient, and cost-effective for schools, clinics, agencies, and private practitioners. ALL PICS contains all of the 2-D pictures necessary to administer the VB-MAPP Milestones. ALL PICS consists of 3 spiral bound books, with pre-arranged fields of high-resolution images that correspond with the VB-MAPP specifications. While conducting a verbal behavior assessment, the evaluator using ALL PICS can quickly record responses on the corresponding downloadable data sheets and then turn from one page of the book to the next. For visual tasks, a corresponding box of labeled flashcards is included, permitting the tester to quickly obtain all cards needed for each milestone without the need to search for cards. Don’t forget to use our promo code ALLPICS this week only to save 15%* on your purchase of this comprehensive verbal behavior assessment tool! *Offer is valid until 11:59pm EDT on March 17th, 2015. Not compatible with any other offers. Be sure there are no spaces or dashes in your code at check out! Tip of the Week: Assess! Assess! Assess! When beginning with a new student, there are two important things you must do. First, pair with your student, as described here. The second is that you must assess! Unfortunately, formal assessment is frequently left out, especially when teachers are working in the home with the learner. Assessment should be the cornerstone of any choices made pertaining to the skills a learner is taught. Indicates and prioritizes what should be taught to your student. 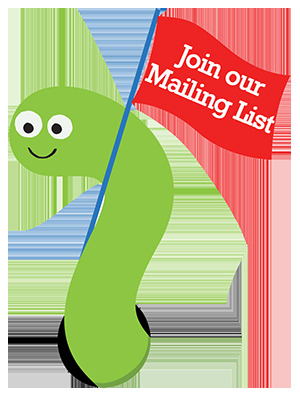 Helps ensure that you are teaching skills in a developmentally appropriate order. Allows you to measure progress. Clearly indicates to parents and other professionals the reasons why you are teaching specific skills. Ensures that you are teaching your learner at the edge of his/her ability. If you’re uncertain about the best assessment to use with your student, contact a supervisor or BCBA for some advice. Reasess yearly and before creating IEPs to have an accurate and current representation of the learner’s skill level. Compare assessment results with other providers to check for generalization across people. Share assessment results with the child’s parents and suggest opportunities for supporting the child’s learning during family activities and daily living. Assessment and data collection are critical for every student on the spectrum…and can get expensive. This week, we’re thrilled to give you a bit of a break by offering the VB-MAPP Set by Dr. Mark Sundberg as our Pick of the Week. 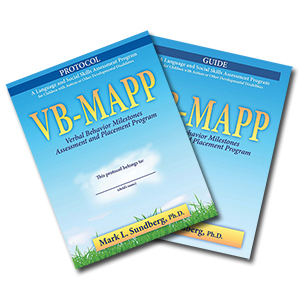 This week only, SAVE 15% on the VB-MAPP Set, VB-MAPP Guide or VB-MAPP Protocol by entering in the promo code BLOGVBM9 at checkout. 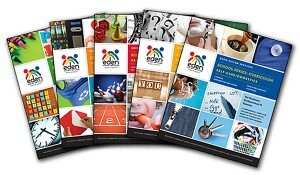 It is with great excitement that we announce the publication of the Eden School’s Assessment and Curriculum Series. This set of seven assessments and curriculum guides provide an expansive range of content for grades Pre-K through 12. This week only, you can save 15% on these new assessments and curricula by entering the Promo Code BLOGEDA at checkout. The Autism Assessment provides educators, therapists, and parents with a tool to accurately assess a student’s current abilities and skill level. This assessment identifies the student’s strengths and weaknesses, assists with goal selection, tracks progress, and makes it easy to translate the assessment into concrete IEP goals. The Autism Curriculum is a comprehensive series of teaching programs designed to provide a valuable resource to enable professionals and parents to effectively teach students with autism. Employing a hands-on approach, the curriculum includes practical strategies for each teaching program. In addition, each skill area includes a systematic assessment and flow chart to support appropriate goal selection. Teaching programs are clearly written, with step-by-step instructions, and include target behaviors, prerequisite skills, criterion-referenced assessment, measurement, materials, procedures, and prompting techniques. Each curriculum delineates Primary, Intermediate and Secondary Skills to help structure learning for students of various ages and abilities. These teaching programs, grounded in the principles of Applied Behavior Analysis (ABA), have been field-tested with hundreds of students and adults with autism. They address essential areas of skill such as cognitive, self-care and domestics, speech and language, vocational, physical education, recreation and leisure, employment, and residential living. This series offers specifically targeted curricula for Infants and Toddlers, a 5-part series for school-age students, and an Adult Curriculum. Teaching programs are clearly written, with step-by-step instructions and include target behaviors, prerequisite skills, criterion, measurement, materials, procedures, and prompting techniques. Each volume includes flow charts to assist with selection of goals. Teaching programs and data tools are presented in wire-bound format for easy use. Each volume comes with a Curriculum, Assessment and Assessment Score Sheet. Additional blank assessment score sheets are available for sale in sets of 10 for each curriculum volume: Infant/Toddler; Cognitive; PE; Self-Care/Domestics; Speech/Language; Vocational; Adult. Developed to specifically address the needs of infants and toddlers (up to age three) with autism, the Infant and Toddler Curriculum contains teaching programs for learning readiness, cognitive skills, oral motor/feeding, receptive and expressive language and communication, play and social skills, sensory-motor, self-care, and preschool readiness skills. 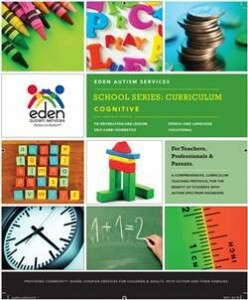 This five-volume series specifically addresses the educational needs of school-age students with autism by skill area: Cognitive, Adaptive Physical Education, Self-Care and Domestics, Speech and Language, and Vocational Education. 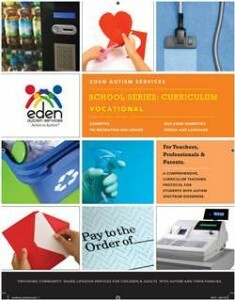 The curricula can be purchased individually or as a set of five. Each volume contains the prerequisite skills, criterion, measurement, materials, procedure, prompting techniques and teaching tips for each target behavior. The Cognitive volume contains teaching programs to address the educational needs of school aged students with autism in the areas of Learning Readiness (eye contact, gross motor imitation), Pre-academics (block imitation, matching objects, body part ID, etc. ), Academics (counting, handwriting, sight word ID, etc. ), and classroom language/social play (categorization, pretend play, etc.). There are more than 85 lessons presented with prerequisite skills, criterion, measurement, materials, procedure, prompting techniques and teaching tips. The Speech/Language volume contains teaching programs for school-aged students with autism which is divided into four domains and then ranked as primary, intermediate and secondary skills. The domains focus on oral motor/feeding, receptive language, expressive language, and pragmatics. There are more than 75 lessons presented in a highly structured, specialized format. 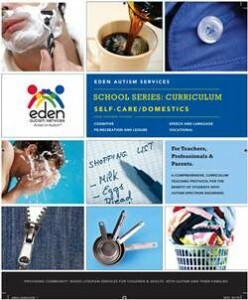 The Self-Care/Domestics volume contains teaching programs targeting daily living activities for school aged students with autism in the areas of self-care and domestic skills. There are more than 60 target behaviors covering primary skills like dressing, hand washing, and toileting to secondary skills such as bathing, shaving, menu preparation, and food shopping. The Vocational volume contains teaching programs specially designed to address a variety of vocational skills for school aged students with autism. The skills taught are designed to prepare individuals with autism and developmental disabilities for adult life and the world of work. The emphasis is on using these teaching programs to foster appropriate levels of independence. There are 55 targets in this volume addressing vocational skills like sorting, labeling, packaging, inventory, stocking, and more. 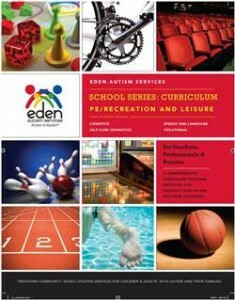 The PE volume contains teaching programs specifically designed to address the physical education, recreation, and leisure skills of school-aged students with autism. While many educators use task-analyzed programs to teach students with ASD, physical education, recreation and leisure skills are often not approached in the same manner. There are more than 35 target behaviors from biking, golf, doing a puzzle to bowling, board games, swimming and video games. The 5-Volume Set includes each volume in the series for school-aged students: Cognitive, Speech/Language, Self-Care and Domestics, Vocational, and Physical Education/Recreation and Leisure. The Adult Residential and Employment volumes have been combined into a single comprehensive volume for Adult Services. Developed for adolescents and adults with autism residing in community-based living arrangements, the Adult Services volume contains teaching programs for self-care, domestics, physical education, and recreation and leisure. There is a complete vocational section that focuses on teaching programs to be implemented in an adult day placement with application in employment settings. 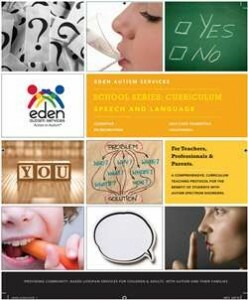 Since 1975, families, educators, healthcare professionals and others with an interest in autism have looked to the knowledgeable, caring and committed staff at Eden for guidance. 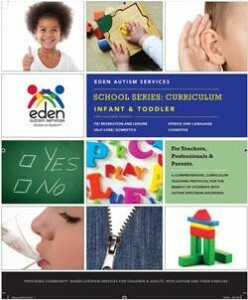 Headquartered in Princeton, NJ, Eden’s expertise includes early intervention services, pre-K through 21 education, adult residential and employment programs, and support and training for families and professionals. 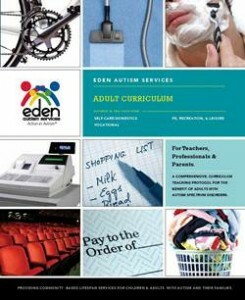 This Assessment and Curriculum provides educators and caregivers with nearly 40 years of Eden’s teaching expertise. *Offer expires on January 15, 2013 at 11:59 pm EST. Not compatible with any other offer. Be sure there are no spaces after the Promo Code when you enter it at checkout. Introducing the Assessment of Functional Living Skills (AFLS) from James Partington and Michael Mueller! 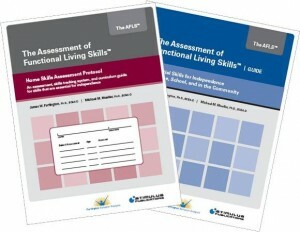 We’re thrilled to announce the arrival of the Assessment of Functional Living Skills (AFLS), a brand new assessment to complement the ABLLS-R, from James Partington, PhD, BCBA and Michael Mueller, PhD, BCBA. This brand new tool assesses Basic Living, Home, and Community Participation skills in individuals with autism, across all ages. This week only, we’re offering this brand new product as our pick of the week. You can save 15% on the AFLS by entering the Promo Code BLOGAFS3 at checkout. The Assessment of Functional Living Skills (AFLS) is an assessment, skills tracking system, and curriculum guide for the development of essential skills for achieving independence. It can be used to demonstrate a learner’s current functional skill repertoire and provide tracking information for the progressive development of these skills throughout the lifespan. The AFLS contains task analyses of many of the skills essential for participation in a wide range of family, community, and work environments and can be used simultaneously with the ABLLS®-R. There are currently three Protocols , and they address these different areas: Basic Living Skills, Home Skills, and Community Participation Skills. 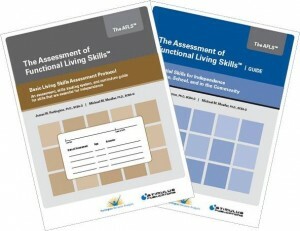 The complete AFLS covers more than 735 daily living skills in 24 skill areas to comprehensively assess an individual’s functional, practical, and essential skills in everyday life, in their home, school, and community. The skills addressed are all based upon overarching goals for maximizing freedom, independence, and opportunities for individuals with Autism Spectrum Disorder (ASD). 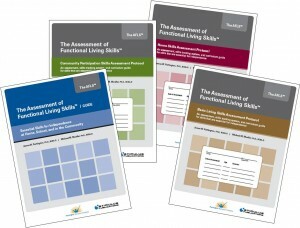 Each assessment module contains eight different skills areas that thoroughly assess functional skills across a wide range of settings throughout a learner’s lifespan. Every module of the AFLS is designed to ensure that parents, caregivers, and professionals provide learners with the very best opportunities to learn how to do tasks for themselves in a broad array of real-world settings. Based on the methodology of applied behavior analysis, the AFLS is a unique tool for assessing basic, home, and community participation skills of individuals with autism of all ages, including adolescents and adults. The AFLS is designed to be an easy- to- use assessment tool for parents, educators, professional staff, and other caregivers. These assessment protocols will help educators, parents and professionals develop enhanced person-centered programming and transition plans, providing critical roadmaps for parents concerned about where their children will go as they grow, and their ability to live active, meaningful lives. 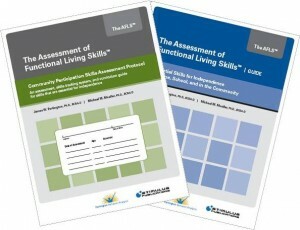 The AFLS is available as a complete assessment, containing the Guide & Scoring Instructions, along with the Basic Living Skills, Home Skills, and Community Participation Skills Protocols: AFLS: Assessment of Functional Living Skills Complete Bundle. Remember, this week only, you can save 15% on the AFLS by entering the Promo Code BLOGAFS3 at checkout. Be among the first to get what is sure to become an invaluable resource today! *Offer expires on July 3, 2012 at 11:59 pm EST. Not compatible with any other offer. Be sure there are no spaces after the Promo Code when you enter it at checkout.